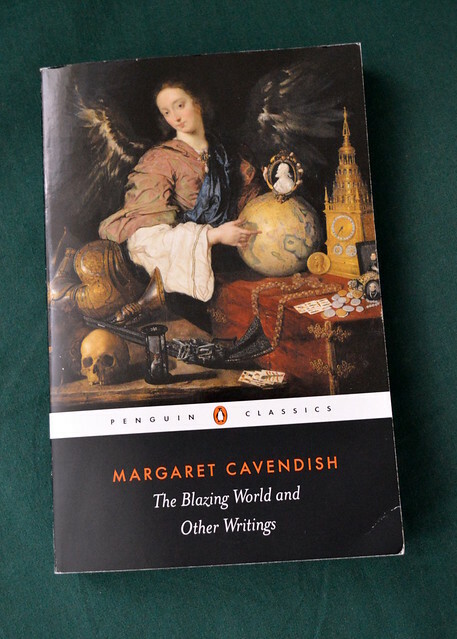 My latest reading project started with The Blazing World by Margaret Cavendish, Duchess of Newcastle. First published in 1666, it’s the oldest work on my list. The story starts when an unnamed Lady – our protagonist – is kidnapped by plot a lovesick strawman and by accident transported from our world into another one via a connection at the North Pole. The beginning reminds me a little of Gulliver’s Travels, for she meets bear-men, fox-men, magpie-men, parrot-men, worm-men, lice-men and grass-green men, among many others. She is taken to the Emperor and becomes the Empress with absolute power to rule. All of this backstory is crammed into the first eight pages. We then take a break from plot and are treated to fifty to sixty pages of questions and answers and arguments between the Empress and various experts (and spirits) on scientific theory and observations. Cavendish does not forget logic and religion or Cabbalas and the possibility of dead sprits communicating with the living, which seem to have fascinated her to no end. The Empress also meets and befriends a namesake of the author, Duchess of Newcastle, with whom she discusses various topics including worldbuilding, travels in spirit form and finally arranges an invasion of her own world. The invasion (the last twenty pages or so) returns us to more action-y storytelling – submarine attacks and firebombing (by bird-men) to defend her native country Esfi against hostile forces. The story ends in a slightly bizarre fashion with a listing of pastimes and recreations that the Emperor and Empress of the Blazing World most enjoy. I confess The Blazing World was a slog for me. While she undoubtedly had a vivid imagination, Cavendish’s writing style and structure are so different from the modern that the text almost put me to sleep several times. While not for me, I’m sure this is a fascinating book for people interested in early scientific theories or women’s writing. Edit: Find all posts in the project with the 21 authors tag.